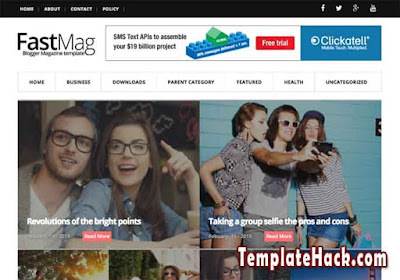 TemplateHack.com - Download Fast Mag premium blogger template. Fast Mag is new generation of magazine blogger theme style. This template made uniquely with big two column featured post to make your latest post more readabele. Not only for magazine blog topic, this customizable blogger template also suitable for any niche or topic blog. You can applied this best fast magazine blogger template on your beauty blog, travel blog, gallery blog, photo stock blog, etc. Page navigation menu, drop down menu, social bookmark ready, ads ready, fast loading, featured post, 2 column, 1 right sidebar, spost thumbnails, browser compatibility, minimalist, clean. Magazine blogger template, news blogger template, personal blogger template, fashion blogger template, technology blogger template, tech blogger template, travel blogger template, beauty blogger template, diary blogger template.